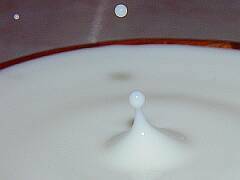 On June 23, 2002, I took around 415 pictures of milk drops falling into a bowl of milk or a shallow puddle of milk. 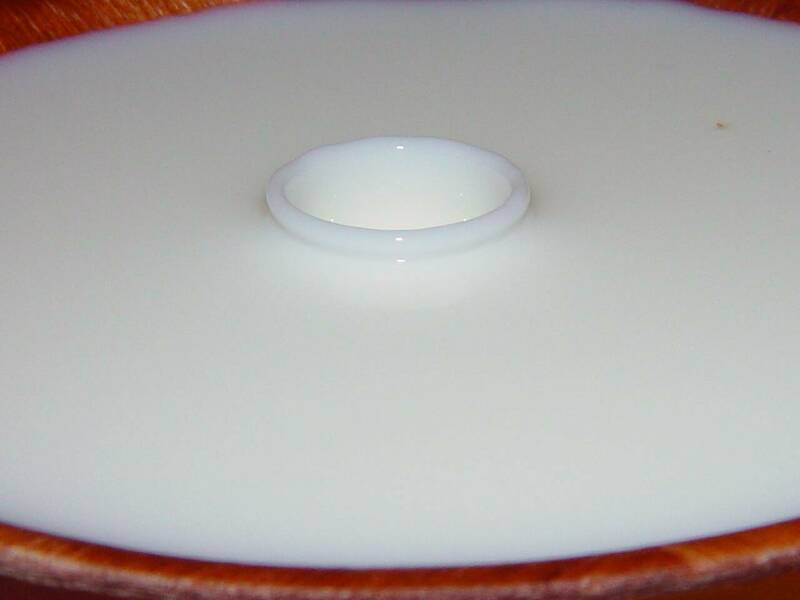 Here are the best 20 of the roughly 100 that actually had something in them. 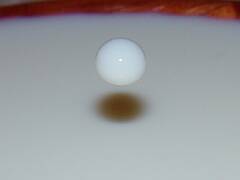 I don't have the equipment to take very rapid shots, and hence each frame came from a different drop, which were dropped from different heights. 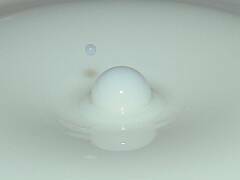 I tried to arrange them in "process order", but I'm not at all sure I understand the process well enough to have done it correctly! 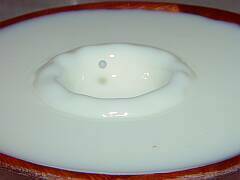 First, here's a drop right before the splash. 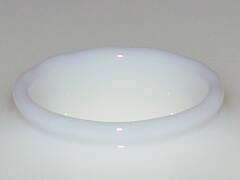 I estimate its diameter at about 4mm. 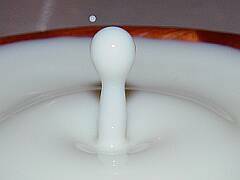 A 4mm milk drop right before the splash. 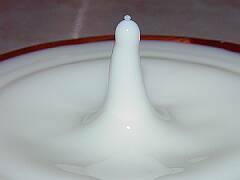 When the drop hits the surface, it creates an outgoing shock wave, which crests and becomes "a crown". 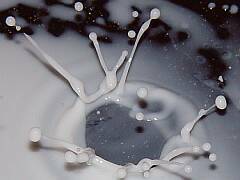 An outgoing shock wave - an emerging crown. 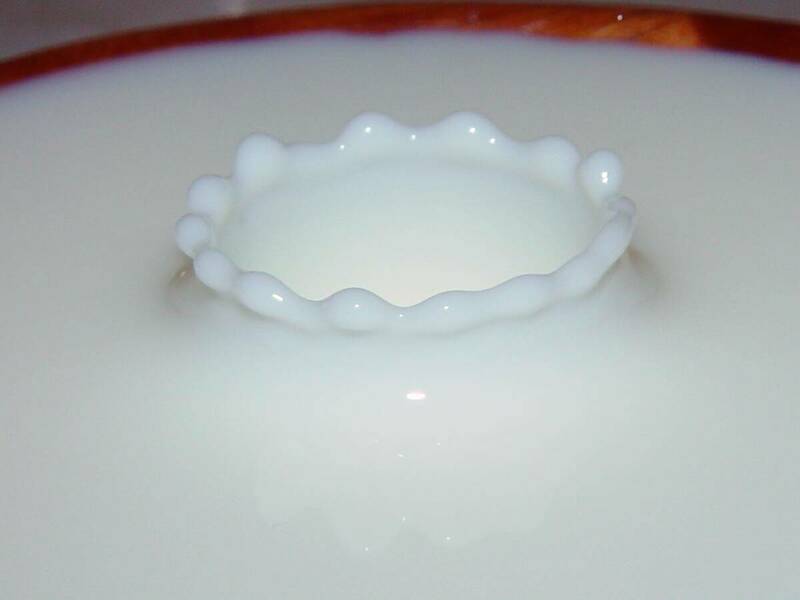 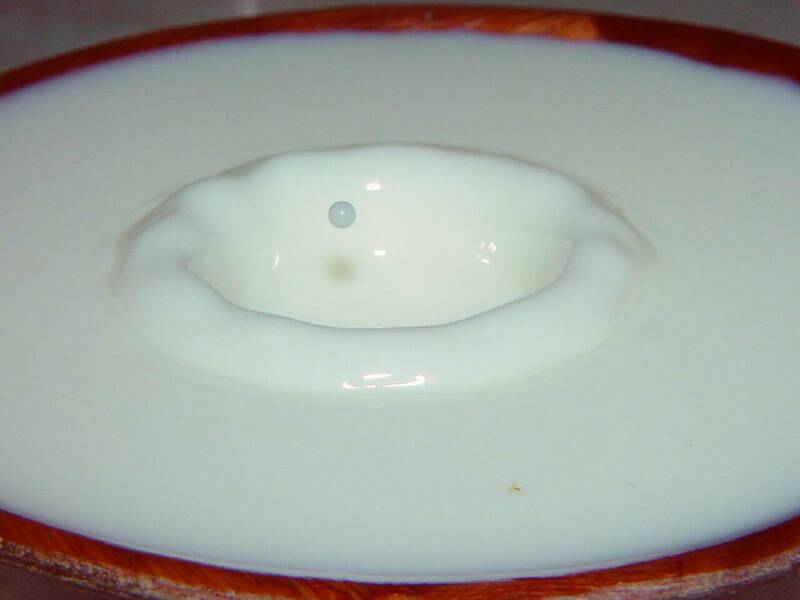 A crown produced by a drop of milk. 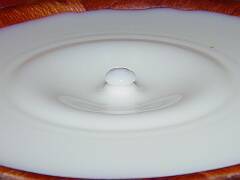 After the crown falls, all is left is a crater. 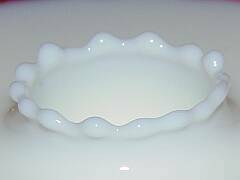 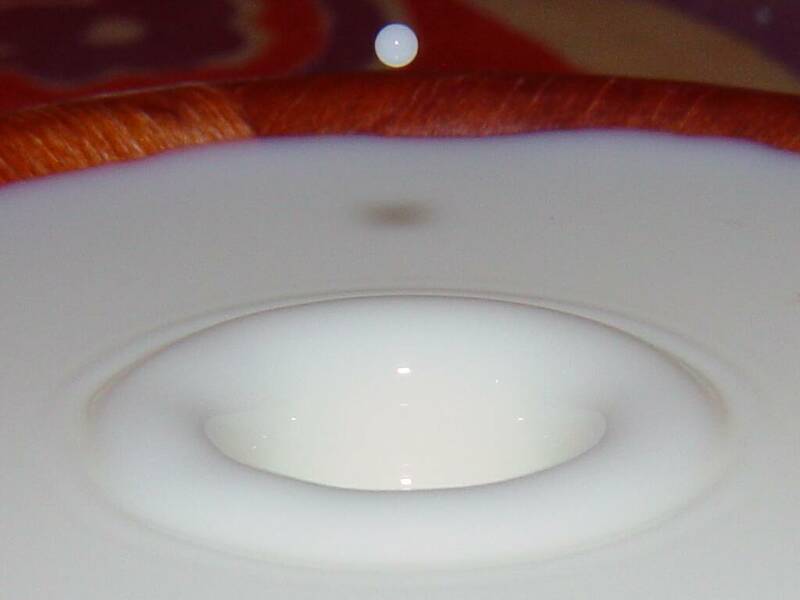 The secondary milk drop seen is perhaps the tail of the original one, which splits off and falls more slowly because its relative surface area is bigger. 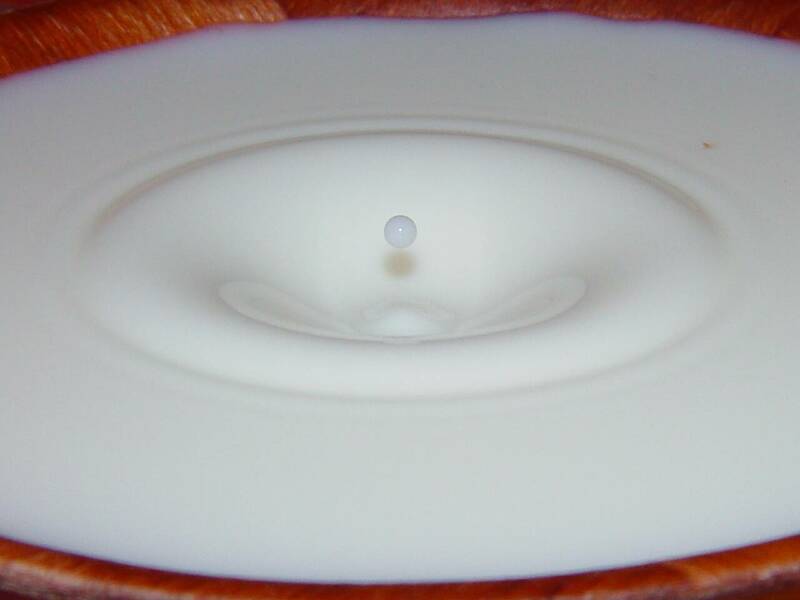 A crater produced by a milk drop. 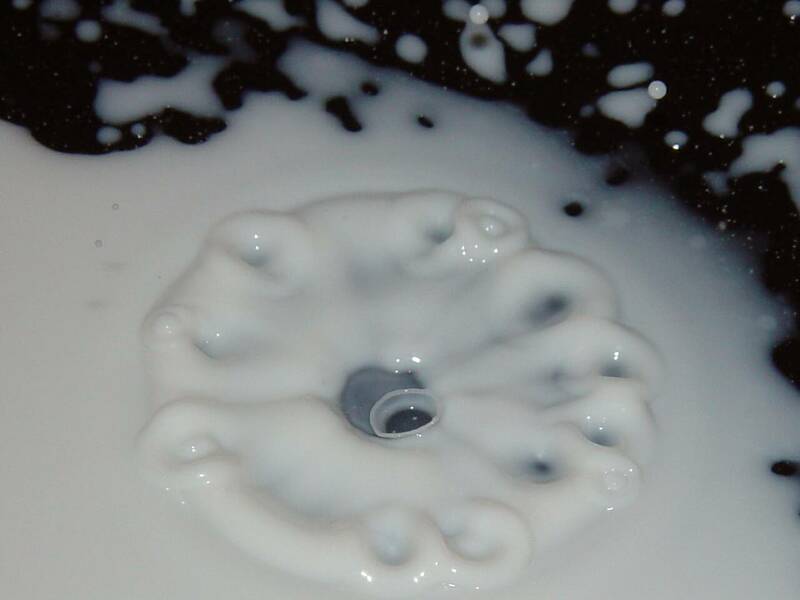 A crater within a crater in a milk bowl. 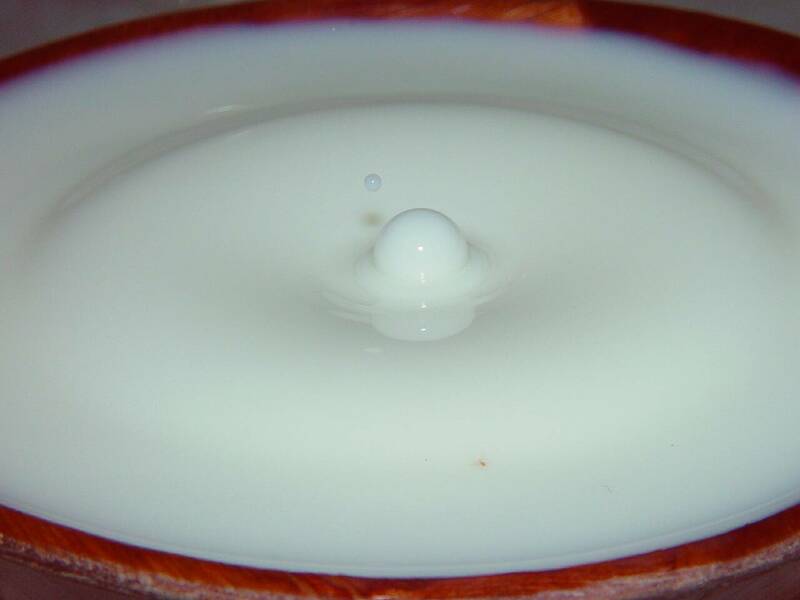 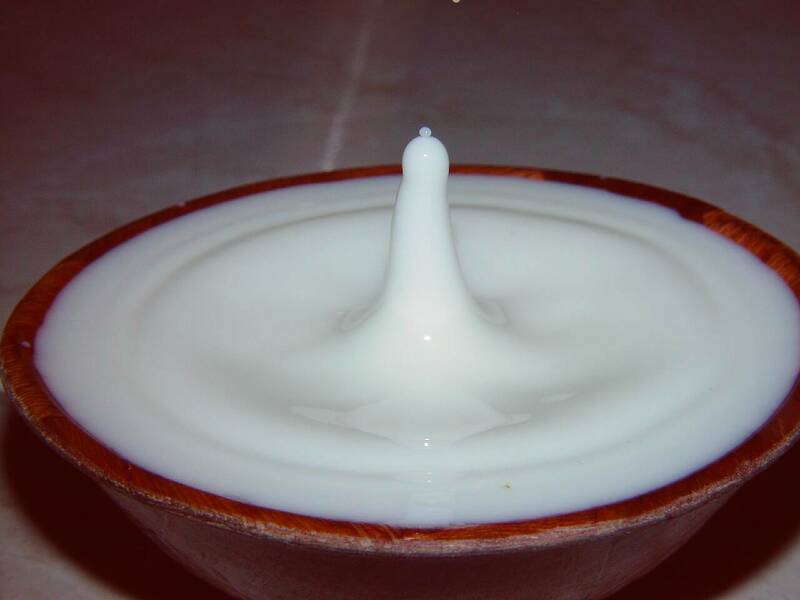 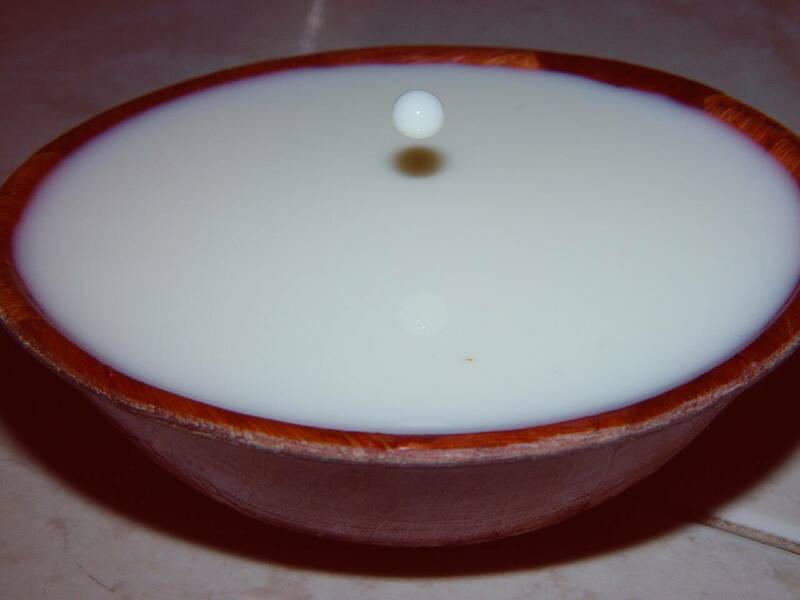 A column of milk shoots out following the impact of a milk drop (beginning). 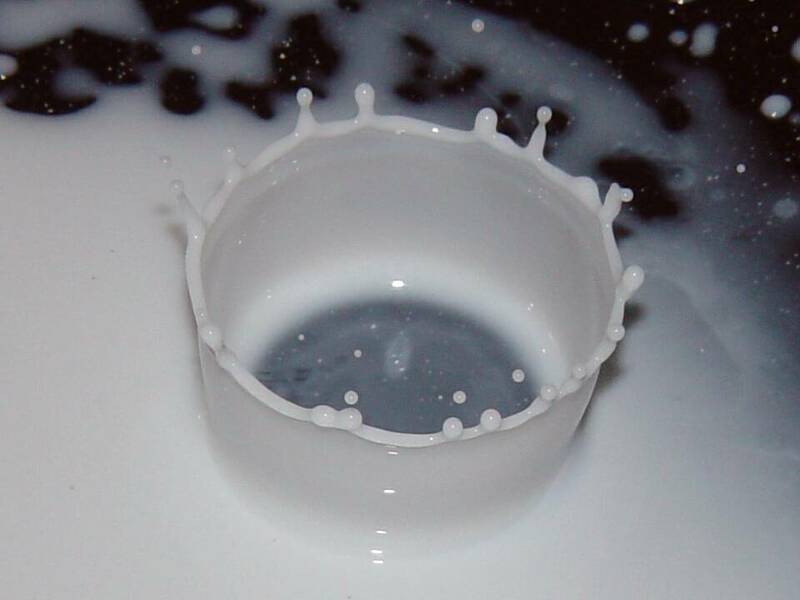 A column of milk shoots out following the impact of a milk drop (at highest). A column of milk shoots out following the impact of a milk drop (now falls back). 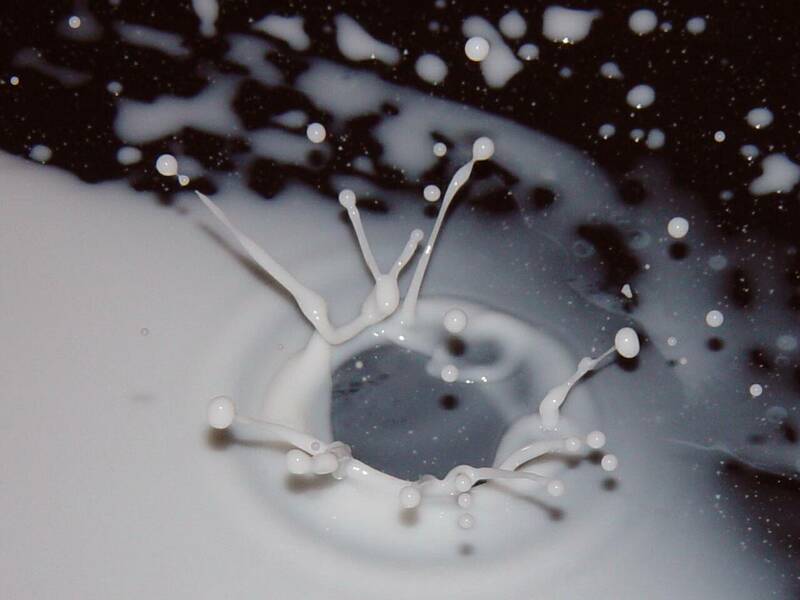 A column of milk shoots out following the impact of a milk drop (now fully collapsed). 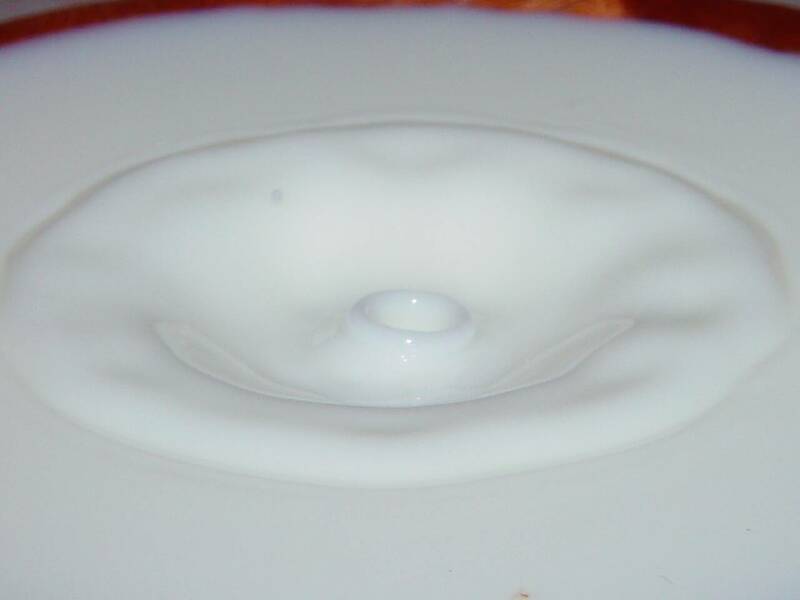 A column of milk shoots out following the impact of a milk drop, collapses, and a secondary column emerges. 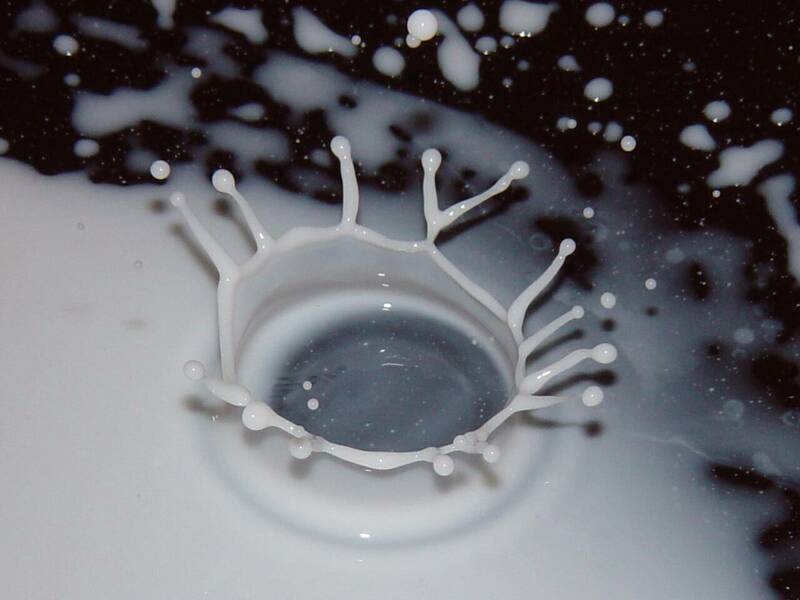 A splash created by the fall of a milk drop into a milk puddle. 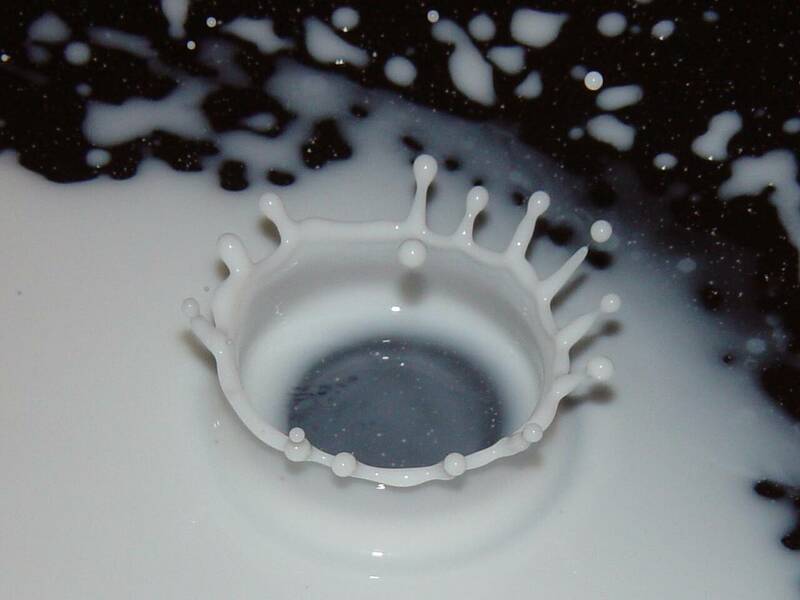 A splash created by a milk drop in a milk puddle and a secondary drop. 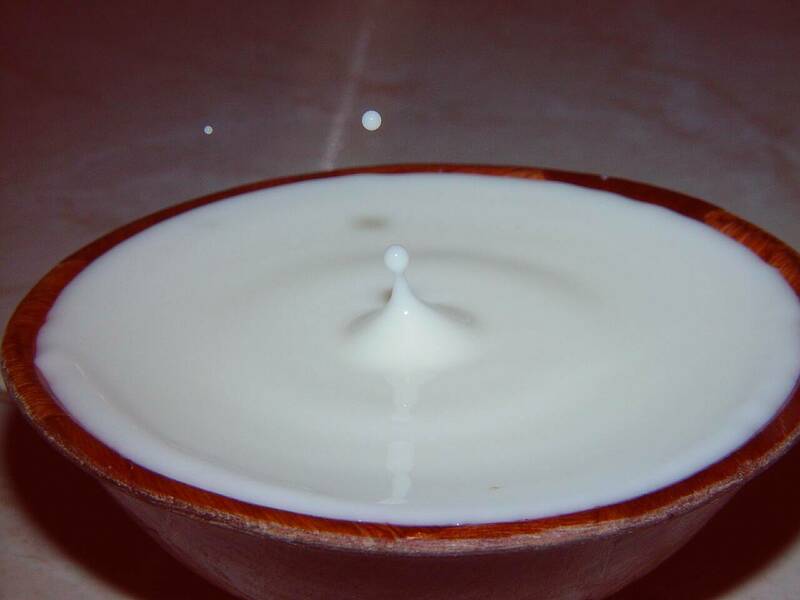 Nested splashes of milk and a ternary drop about to hit. Do it yourself! 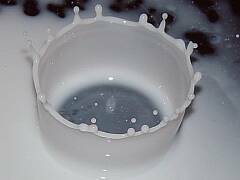 I took a milk carton, stuffed its opening with a paper towel and let it stand sloped down on a chair, so that I got a constant flow of milk drops down to the floor, at a rate of one per maybe 10 seconds. 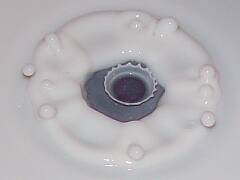 Down below was the bowl/puddle, and around 30 centimeters away I had my camera on a tripod, focused manually on the impact point. 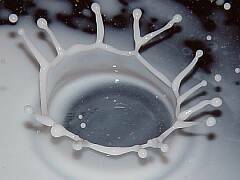 I used the camera's flash as a strobe light to hold the motion, and also used a very fast exposure time - 1/1000sec or so. 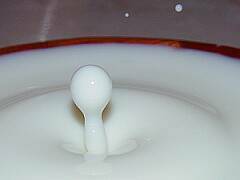 The point of the fast exposure was not to hold the motion - that was achieved by the flash - it was just to make sure that from the perspective of ambient lighting the pictures would be hugely underexposed. 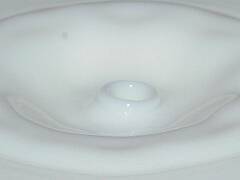 So I could play with everything at normal room lighting and yet have a dark room and a strobe light in as much as the camera was concerned. 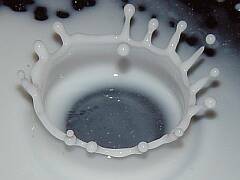 With this setup I took my 415 pictures or so, watching each one on the screen of my digital camera and getting better at synchronizing with the drops as I went along. 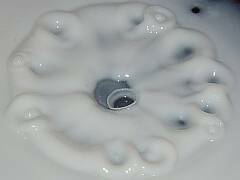 I'm sure you can do better! 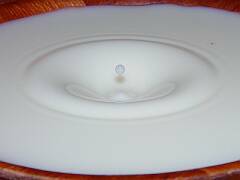 Environmental Statement: The bowl I used is tiny (8cm diameter, 2cm deep) and in total I used less than half a cup of milk.